Watch: Behind The Scenes of "For Love Of Country"
Media coverage of our veterans frequently revolves around PTSD, poverty and difficult re-entry into civilian life. But in a new book, Starbucks CEO and veterans advocate Howard Schultz and Washington Post senior correspondent Rajiv Chandrasekaran stress this is only a tiny part of the story. Just 5 percent of Americans have a direct tie to our veterans, and as a result, many of the efforts they make to improve our communities here at home go unnoticed or unrecognized. Why it’s time to bridge the civilian-military divide and give veterans a new voice in the national dialogue. Rajiv Chandrasekaran Senior correspondent and associate editor at The Washington Post. Howard Schultz Chairman, president, and CEO of Starbucks. MS. DIANE REHMThanks for joining us. I'm Diane Rehm. 2.6 million Americans have fought for the U.S. in Iraq and Afghanistan over the past 13 years, but in an age when very few Americans have direct ties to the military, a new book argues we've become increasingly disconnected from our veterans leading us to undervalue their potential and their contributions to our communities. The book is titled, "For Love of Country: What Our Veterans Can Teach Us About Citizenship, Heroism and Sacrifice." MS. DIANE REHMHoward Schultz is chairman, president and CEO of Starbucks, Rajiv Chandrasekaran is associate editor of The Washington Post. The authors join me here in the studio and we will be taking your calls, 800-433-8850. On this Veteran's Day, I do hope you'll join us. Send us an email to drshow@wamu.org. Follow us on Facebook or send us a tweet. MS. DIANE REHMHoward, Rajiv, welcome. MR. HOWARD SCHULTZGood morning, Diane. MR. RAJIV CHANDRASEKARANThank you. Good morning. REHMGood to have you both here. Howard, you start this book, "For Love of Country" with the story of Leroy Petry. Tell us about him. SCHULTZLeroy Petry is an extraordinary person and one afternoon, the armed forces network within Starbucks, which is a military veteran group of employees, invited him to speak. I did not know who he was, to be honest with you, other than the fact that he was awarded the medal of honor. 4,000 people assembled in an area within Starbucks to listen to his story. SCHULTZAnd as he began to speak, he shared with us a video of what he was describing. I can go through that with you, if you'd like. He was describing the fact that he was in a very, very difficult fire fight in which grenades were coming over as well as gun fight. And one grenade that came over was about to explode and seriously injure or kill him and his men. Without thinking about anything whatsoever, within a split second, he reached over and picked up the grenade to throw it to the other side. SCHULTZAnd as he did that, the grenade exploded in his hand. The story, the way he told it, and his humility, his valor produced a array of emotions in all of us at Starbucks. I could look over and I could see people crying and -- but he told it with a high degree of respect for his men above himself. I had a private moment with Sergeant Petry and his wife after he spoke to everyone at Starbucks and a few things came out of that. SCHULTZOne is he shared with me that he was just doing his job and the fact that he was not and is not a hero. I've actually found him to be somewhat embarrassed by the fact that he was awarded this unique medal of honor. And then, I asked him, candidly, which is not in the book, is there anything we can do for you? And he said, rather sheepishly, if you can just give me some gas money. SCHULTZAnd when you are in the presence of someone like this who has given so much of himself and you hear, one, I'm not a hero, just doing my job, and then you hear something like gas money, it rivets you back and you just no longer can be a bystander. And that started, among other things, this journey that I've been on and I've been very fortunate to be on it with Rajiv. And I can tell you that in the visits we've had to military bases, the Pentagon, Walter Reed and the many, many emotional conversations we've had with veterans, their family, their children, I've asked myself many, many questions about the unintentional consequences of an all volunteer force because the American people are just not engaged. SCHULTZIt's not that they don't want to be. They just don't understand. And the last thing is, I ask myself sometimes if we, as Americans, deserve these people because they are beyond heroic and they have -- they're willingly sacrificing and volunteering every single moment of every day, themselves, and then there's so many aspects of the last 13 years that are an anomaly with regard to other past wars. There are multiple deployments, the fracturing of families. It's just -- we need to do much more. REHMOne detail you did not include in your beautiful recitation of that meeting was that after he realized his hand was gone, he applied a tourniquet. He wanted to continue, but the medics told him both legs were bleeding. They had been shot as well. SCHULTZWell, I think -- that's very true. I think in the moment, the adrenalin and his commitment to his men, the way he told the story to me, he did not realize he was shot in his legs. And Rajiv, you've heard that as well. REHMExtraordinary story. Rajiv, I know you have talked to a great many of these men and women who have served both in Iraq and Afghanistan. You were there, indeed, on some occasions. How did you and Howard get involved together? CHANDRASEKARANIt's a great story. As you know, Diane, you know, I spend two and a half years as a Washington Post war correspondent in Iraq, the better part of three and a half traveling back and forth to Afghanistan to write about the troop surge there. Earlier this year, as I was working on a landmark survey of post 9/11 veterans at The Washington Post, I happened to connect up with Howard through a mutual friend who works for Howard. CHANDRASEKARANAnd we sat together at a restaurant here in D.C. and I brought the raw data from the survey and started to present it to Howard. And we were joined there by another great American leader, a retired four-star army General Pete Chiarelli, who's a real advocate for dealing with traumatic brain injury and post traumatic stress. And he was helping to provide his analysis. And among the many eye-popping findings from the survey, one really, really got under our skin. CHANDRASEKARANAnd that is that 55 percent of this generation of veterans, Diane, feel disconnected from civilian life in America. And Howard and I looked at each other and, you know, both, I think, thought at the same time, how could this be? We send these brave men and women off to fight for us. They volunteer. They serve bravely, nobly, many cases repeated deployments. They come back home. They take off their uniform and now they feel unmoored from the very society they went to go and serve and protect. CHANDRASEKARANBecause we believe -- well, there are multiple reasons. You know, the military shares some blame. I think these large army posts where people live and work and go through their lives kind of cut off from civilian world help to create some of this isolation. But I think the biggest reason is that civilian society in the United States has been really disconnected from what these men and women have done. We've gone about our lives blissfully unaware, continuing to shop, continuing to go on with business as usual. CHANDRASEKARANI mean, it's a rare newspaper, it's a rare radio program, yours is an exception, that devotes substantive time to the issues, focus on what our military has been up to. And, you know, it's a great thing that we have this all volunteer force. It's given us our best, most disciplined, best trained army in our history, but we have an obligation as citizens to be connected, to understand who's fighting for us, what they're doing and what they have to offer on the home front. CHANDRASEKARANAnd that's what we're trying to reconnect. We're trying to build this bridge between civilian America and military America. REHMRajiv Chandrasekaran, Howard Schultz, their new book is titled "For Love of Country: What Our Veterans Can Teach Us About Citizenship, Heroism and Sacrifice." Do join us, 800-433-8850. Send an email to drshow@wamu.org. Howard, what happened to Leroy Petry? SCHULTZAfter all this? Well, Leroy Petry has retired from the army and I actually went to his retirement ceremony, which unto itself is something I had never been to before, did not know what to expect. And this was at Fort Lewis, joint base in Seattle in Tacoma, Washington. You want me to describe that to you? It was, again, you walk into a theater, looks like an old movie theater, there are hundreds, maybe a thousand men and women in fatigues. SCHULTZThere's military brass there and there are retired military and family. The ceremony was made very special because Admiral McRaven, who -- I don't know his exact title. CHANDRASEKARANIt was the head of the special operations command at the time. SCHULTZWho is a Navy man, as he says. He's a sailor. He met Sergeant Petry at the West Wing and Sergeant Petry asked him specifically if he would come and present him with his retirement. And Admiral McRaven came and gave this extraordinary talk. But the highlight of that ceremony, which I must say brought me to tears, was the following. At the end of the ceremony, the entire group of military that was assembled there, army rangers, stood up in unison and started reciting the army ranger credo. SCHULTZAnd then, I saw children of families of army rangers reciting it as well. It was just an extraordinary moment. REHMWow. Short break. We'll be right back. REHMAnd welcome back. We're talking about a new book with two people who have told the stories of veterans who've served this country. Their book is titled "For Love of Country." Howard Schultz is the CEO of Starbucks Rajiv Chandrasekaran is associate editor of the Washington Post. I hope you'll join us, 800-433-8850. Now, here's an interesting comment on the website from a Vietnam-era draftee and veterans who says, "Don't thank a veteran for his service or her service. It's a false equivalency and a shameful one. You're just blowing that person off so you can go back to your everyday carefree existence. That service is a sacrifice and a duty you will likely never hope to understand." Rajiv. CHANDRASEKARANThe commenter is right in many regards. And what we say at the end of the book is, don't end the conversation with the words, thank you for your service. That should be the beginning of a conversation. Take the time to get to know the veterans in your community. Make it personal. Ask them about their transition to civilian life. If they're thriving, give them a pat on the back and, you know, a firm handshake. CHANDRASEKARANIf they're struggling, find ways to try to help at the local level. This isn't about, you know, a grand top-down Washington-driven initiative. This isn't about people having to write checks. It's about people to people engagement. And sure, those who haven't served can never truly understand what it's like to go to war. But that doesn't mean that they shouldn't at least try to understand the veterans in our midst and who they are and how they're contributing. REHMHoward, there are ten stories in this book. Bill Krissoff's son died in combat, but Bill himself chose to enlist at age 60. Is that -- am I reading that right? SCHULTZYeah, you are. I have to yield to Rajiv because he tells this story so well. It's not only did he lose his son Nate but his other son Austin was in the service as well at the same time and could have come home and decided not to. But, Rajiv. CHANDRASEKARANIt's a remarkable American family. Bill Krissoff, an orthopedic surgeon in Reno, Nev., two sons, both go to an elite high school, then go off to great liberal arts colleges on the east coast. Could've chosen to do anything with their lives but seared by the events of 9/11 both decide they're going to join the military. 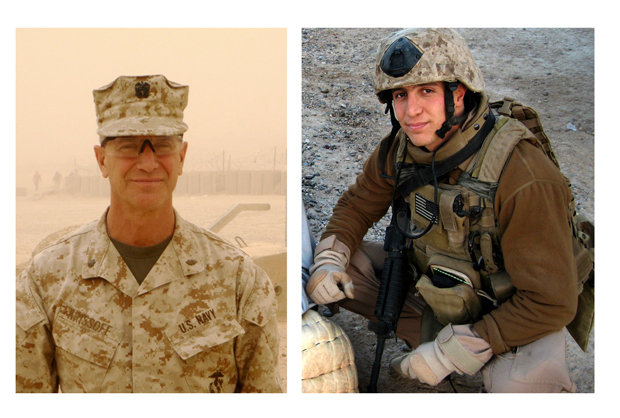 His eldest son Nate becomes a first lieutenant in the Marines, becomes an intelligence officer, is deployed to Iraq and is killed by an improvised explosive device near Fallujah. CHANDRASEKARAN...motivated by the selflessness of his two sons. I should also notice, as Howard was saying, in between the news of the death of Nate and the repatriation of his body back to Nevada, his son Austin who as in officer candidate school in Quantico, Va. is commissioned in the Marine Corps. He could have quit. The Marines said, sure, you know, no harm, no foul, you can go. You're the only surviving child of this couple. But he said, I'm going to stay in and honor my brother. CHANDRASEKARANSo Dr. Krissoff has this great conversation with the recruiter. And then at the end of it the recruiter asks him, well, sir, how old are you? He says, I'm 60. And the recruiter almost laughs at him. Well, you're 18 years too old to join the military. But Bill Krissoff can't get this out of his head. And a couple months later he receives an invitation, he and his wife, to hear President Bush address a convention of the American Legion in Reno. And so they go. CHANDRASEKARANAnd as gold star parents, parents of a fallen service member they are accorded an audience with the president. And the president begins that meeting with a group of gold star parents by saying, you know, if there's ever anything I can do for you, let me know. And one, you know, parent raises his hands. He says, I've got some problems with my benefits and this and that. Dr. Krissoff goes right up to the president and says, sir, there is one thing you can do. I would like to serve but they tell me I'm too old. No disrespect, Mr. President, I'm younger than you are. CHANDRASEKARANSo Bush summons over Karl Rove, get this man's information, says we're going to meet with the Chairman of the Joint Chiefs of Staff in two days. Well, three days later, the day after that meeting, Bill Krissoff gets a call from the very same recruiter who almost laughed at him and says, sir, I have orders to meet with you by the end of the day. CHANDRASEKARANAnd Bill Krissoff then joins the Navy Reserve Medical Corps. Now, at that point those officials, even the folks in the White House who got him the age waive think, all right, he's going to just work at a Navy hospital in America, maybe volunteer one month -- one weekend a month. Well, in 2009 Bill Krissoff goes off to Iraq for seven months. CHANDRASEKARANYeah, he doesn't even have time to unpack his bags when he hears there's a need -- a real need for trauma surgeons in southern Afghanistan, the height of Obama's surge there. And it's a land with a lot of improvised mines, a lot of need for orthopedic surgery. So in February, 2010 at age 63, Diane, he goes to southern Afghanistan. He lives in a tent with ten other men, sleeping on a cot. And in those seven months he's either the primary or assisting trauma surgeon on 225 cases, saving the lives of dozens of American, British and Afghan service members. CHANDRASEKARANWe met one of them. We met a guy. He lives in Beltsville, Md. And he's lost three limbs. He appeared on Bill Krissoff's operating table as a mound of flesh, he says. And he didn't know which side was up. And he saved this man's life. Today this man is married. He has a great job in the intelligence community in the U.S. government. He drives a specially modified pickup truck up and down I-95. Here's a guy who's living a pretty good life today. And he wouldn't be here if it wasn't for Dr. Krissoff. REHMAnd I hope Dr. Krissoff is back at home. SCHULTZHe is back at home and I think very proud of what we've written about his family. And we've had a wonderful opportunity to meet him and understand his story. And that's what this book is about, trying to share these remarkable people with the American people, so people will understand. REHMBut I do think you're right, that the stories that get put forward are those about PTSD, are those about homeless veterans, are those about veterans who committed suicide, all terrible, painful stories, but not the good stories. SCHULTZWell, I think the point you're making, in many ways the war for many veterans begins at home. And this is the subject that I think the American people don't understand. And when you are in someone's -- when you're in the midst of these families and you hear the stories, when you sit down with a young boy named Max who's eight years old -- we write about him in the last chapter -- whose father was killed in Afghanistan, who was a social worker who volunteered. SCHULTZAnd he and his mother are sitting with Rajiv and I and they're telling us this story. And finally his mother says, Max, why don't you tell Rajiv and Howard what you wanted to put on dad's tombstone. And Max, eight years old at the time says, soldier of kindness. And you yourself are holding back your own tears and emotion and trying to be strong. But when he and his mother leave your office, once again you realize and you ask the question, what is our responsibility now that we've heard this story, that we've met Dr. Krissoff, to somehow elevate this conversation and make this a bigger part of the American narrative? And that is the manifestation of why we're here, why this book exists. CHANDRASEKARANDiane, too often the narrative around veterans in our society is focused on pity, on looking at them as broken individuals. And, look, there are many veterans who are struggling with their transitions, who are jobless, homeless, others who have come back with serious physical and mental injuries. And we pay attention to those in the book. CHANDRASEKARANThere's been a lot of media coverage around that though. There've been other books written about that. There are movies and television programs that focus on that but people haven't really told the story of veterans from this generation who are actually having successful transitions, who are thriving and contributing. CHANDRASEKARANYou know, back in 1946, if your neighbor was wandering the street crazed at night because of shellshock, you knew that not every veterans was like that because your husband or your brother or your son or your father served. There was a shared -- this common understanding experience about who our veterans were and what they had to offer. Today we don't have that. So if a veterans unfortunately goes up and shoots up a workplace, everybody thinks, or a lot of people think they're all crazy, that they're all ticking time bombs. And the truth couldn't be further from that. So we're just trying to broaden the aperture here. REHMAnd it does make it harder for veterans to get jobs, for example. And where do you come in there, Howard? SCHULTZWell, I think one of the most important aspects of veterans reentering civilian life is the sense of belonging and the self esteem that comes with a job. Unfortunately, unemployment among veterans has been and continues to be higher than the national average, in some cases because of the stigma and the trepidation that business owners or CEOs have about hiring a veteran because of fear of PTS or brain trauma or unpredictability. SCHULTZWhat I'm trying to do is share what has happened at Starbucks. We made a commitment to hire thousands of veterans. We are well on our way. And I have seen firsthand the significant contributions they are making to our company as a result of their experience, leadership skills, integrity, ethics, mission-driven, all of the things that they have around problem solving. Remember, they have been in life and death situations. This is about profit and loss. They're high performers. SCHULTZAnd there's a secondary benefit that we found, and that is the people who are working alongside them have such pride and understanding. And it's helped the entire organization. So one of the missions of the book, and my personal mission is to convince business owners, small and large, fortune 500 CEOs to hire veterans. And one way to do that is to integrate the HR department into the mix. And by that I mean you must have someone within the HR department who has a high degree of understanding and sensitivity to the veteran issue. And the best way to do that is to have a veteran within HR who understands the language and the anxiety. SCHULTZRajiv and I heard something that was, again, another stunning remark from a veteran, when we had an enlisted man say to us, the truth is I have more concern, anxiety and trepidation about going to a job interview than I have going back to Afghanistan. And when you hear those kinds of things -- because in many cases they have not had a traditional job. They've never written a resume. They've never been in a traditional job interview. SCHULTZAnd so the balance -- the issue here is that the employer must meet them more than halfway. We need to help veterans create their resume, create transitional skill levels to get back into the workforce. But we must allow the families to transition back to civilian life. And the best way to do that is for the veteran to have a sense of belonging, a core purpose and a job. REHMI'd like to hear about Captain Kelly McCoy. CHANDRASEKARANGod, she's another just absolutely remarkable member of our military. So Kelly McCoy, 5' tall, 100 pounds, child prodigy, gets into West Point. Comes out of West Point as one of the top students in her class, goes onto the 82nd Airborne Division. In Iraq in 2003 her platoon is ambushed. She saves her platoon from a series of IED blasts and a small arms ambush by leading the counterattack, pulling wounded men out of their trucks, eventually packing 12 soldiers into a Humvee and driving them all back to base. CHANDRASEKARANAnd for that she became the first female soldier in the 82nd Airborne Division to be awarded a bronze star medal with a valor device. Now in the army's books, that's what makes her a hero. But to us, as we uncovered her story, it was far more than that. She would volunteer to go back to Iraq two more times, once with the Delta Force, another time leading a team of soldiers clearing roads from makeshift bombs. She'd go back to Afghanistan twice. CHANDRASEKARANDiane, since 9/11 she has spent more than 1500 days at war. That's almost five years. I mean, it's just a remarkable commitment. And she exemplifies, I think, some of the -- just the great sacrifice and service members of this generation of our military personnel. REHMAnd you're listening to "The Diane Rehm Show." We've got lots of callers so I want to welcome them in, 800-433-8850. First to Pat in Flint, Mich. You're on the air. PATYes, hello. Love your show, Diane. PATThis is a fabulous time to be having this discussion. My daughter and I Elizabeth take an annual father-daughter's weekend. This year we decided to go to Toronto. It's a bit of a run but we went up to Toronto and I was just blown away by the -- excuse me, it almost makes me tear up -- the -- you could not walk five steps without having counted ten people that had red poppies on their lapels. You could not go very far without having a demonstration of how proud they are of their military. PATWe went to Casa Loma which is a popular place for tourists to visit. It's a castle built in the center of the city that overlooks from the bluffs down onto the harbor area. And they had the whole third floor of this building was military people from as far back as you can imagine talking about their experience being in the Canadian military. PATIt was like everybody was aware of this incredible gift to their country that was there to protect them. REHMIndeed. Margaret Atwood, the Canadian writer was here yesterday. She wore black and she had on her lapel a red poppy, the same symbol that Pat from Flint, Mich. is speaking of. And I gather at the Tower of London there is a sea of red poppies. We're going to take a short break now. And when we come back, more of your calls, your email. I look forward to speaking with you. REHMAnd welcome back. If you've just joined us, Rajiv Chandrasekaran is with me. He's associate editor at the Washington Post. Howard Schultz is chairman, president and CEO of Starbucks. Together they've written a new book. It's titled, "For Love of Country: What Our Veterans Can Teach Us About Citizenship, Heroism and Sacrifice." REHMGoing to go back to the phones. Let see if we can go to -- if I can get this mouse working -- to Bill, in Edwardsville, Ill. Hi there, Bill. REHMWhere do you come out on this, Howard Schultz? SCHULTZI've been asked this many times over the last week and a half. Obviously, Rajiv and I are not policy makers. I'm not sure the draft would be the right solution. What I would more likely see -- to be honest with you -- would be mandated volunteer service to come to the United States of America. A minimum of a year. And to see volunteerism be threaded into American life in a unique way. REHMBut are you talking about immigrants only? SCHULTZNo, I'm not. I'm talking about everyday American families volunteering young people for mandated service -- all kinds of service -- to enhance the lives of everyday Americans. REHMHow would that be different from a draft? SCHULTZWell, I'm not talking about military service. I'm talking about service into -- back into our society. The draft is -- I would say this, if there was a draft over the last 10 years or so, I'm sure we would have had similar demonstrations in the streets of the county that we had during the Vietnam War. REHMHow do you measure that, Rajiv? And why do people continue to say that? It seems to me that our World War II veterans, who did participate in a draft, showed a heck of a lot of skill and courage. REHMI want to interrupt you there for a moment because it does strike me that they are saying what politically they may need to say rather than what is necessarily the truth. CHANDRASEKARANWell, and Howard's point is right, that if we had a draft then we probably wouldn't be in Afghanistan today and the Iraq War would have been much shorter and probably, you know, wouldn't have occurred at all. But if you put aside the issue of whether there should be a draft or not, draft army, non-draft army, we all have an obligation to those who serve. SCHULTZCan I add one very quick thing? SCHULTZSorry to interrupt. I think this leads into another issue, and that is that the American people have lost trust and confidence in the leadership of the United States Congress and, to a degree, the administration. The need that we now have in America is a dire need for authentic leadership and truth. And we are longing for it. And so the issue of a draft or volunteer service is threaded into the fact that the polarization and dysfunction in Washington must end. And we must get the kind of the leadership the American people deserve. REHMHere's an email from Cathy, who says, "I'm the mother of Marine currently serving. The one factor most often left out of this discussion of why troops feel disconnected is that many who serve went into the service disconnected. Many of those who enlist did not have other options, came from broken families. Society needs to realize they often send wounded and damaged people into war zones." CHANDRASEKARANThere is some truth to that. People come into our military from all walks of life. And indeed, there's some who join because they've had employment challenges elsewhere, they're looking for money, they're looking for support from the G.I. bill to go off to college. But we also encountered many others who had ample professional opportunities, ample educational opportunities, but chose to serve because they're fathers and grandfathers did. They chose to serve because they were motivated by a sense of patriotism. CHANDRASEKARANIt would be wrong to suggest that there's any one dominant reason why people join our military. I think it's one of the great aspects of our society. The military draws people from all walks of life. REHMAll right. Let's go to Jim, in Sag Harbor, N.Y. You're on the air. JIMGood morning. I think your guest has skirted the question about why so many come back disconnected. And, you know, that recent email -- I don't think it's fair to say, well, most or some of them were disconnected when they came in. Think of it this way, we send 17, 18, 19, 20, 21 year old kids to war. They are unformed as adults. The life they come from turns into a hostile, killing environment where they're either going to kill or be killed for the most part. JIMNow we send them more than once -- two, three, four times. They come back. They've never had a civilian job. They may not have had a completed civilian education. And they have not interacted as adults in a civilian society. So the problem is much bigger and more complicated than we are addressing as a nation. SCHULTZI think we agree with everything you've just said. SCHULTZI -- we're not skirting the issue. I think the issue is quite complex. But as a result of what you just have summarized, the question is what should we do as Americans? And I think Veterans Day is an opportunity to celebrate and have a high degree respect and amplify the national narrative around what these young people have sacrificed for us. The Veterans Day issue in America, as opposed to what Diane described in Canada and the caller described, has turned into a national sales day or a mattress sale day. SCHULTZThat is not what's necessary and that's not respectful. I agree with everything you've said. The book, the concert that we're having this evening are all designed to elevate the conversation, to describe in great detail the empathy we need to have to those people who are coming back in a different way they went, and to also make sure that people understand that the war for many begins at home. And we as a society need to do as much as possible and business owners in the private sector needs to step in and help them find a job. REHMAnd just a note here, both Rajiv Chandrasekaran and Howard Schultz are donating proceeds from the sale of the book to Onward Veterans. That's a donor advised fund of the Schultz Family Foundation that supports successful transition of military veterans and their families. These are such powerful stories. And I'm sure our listeners have their own powerful stories. Let's go to Sally, in Royal Oaks, Mich. Hi there. SALLYAnd good morning to your guests. It's an absolutely wonderful show for Veterans Day. SALLYI just, you know, I just have a couple of comments. And it's interesting the last caller, maybe he phrased it wrong, skirting the issue, but I have to tell you I feel the same way. The representation of -- it seems like this narrative should be -- and you're speaking to the -- to your -- you need a different audience in the sense that you -- I think that the people on the Hill need to hear this. I think the American people actually -- if I'm a represent and I believe I am, we know. SALLYWe get it. In 1946 when you refer -- when Mr. Rajiv (sic) referred to 1946, 1946 we had a social fabric in this country. There were hospitals designed to take care of people who suffered Post Traumatic Stress for whatever reason. We had more of a national health program then than we do now, actually. We had a national conscience. And we had a collective conscience I believe and I think we are the patriots. Early in the conversation your guests referred to, you know, these great heroes walking among us. SALLYI agree with that, but you know what? We're the heroes, as well. We are the heroes. We -- this war, both of the wars -- I don't want to get into the whys and wherefores, but if the responsibility for war should not be on the person fighting it, as much as it is, look, if we send you out we're going to be responsible for you going and for you coming back. I'm from the Vietnam era and I know a lot of people during that time that went to war, went so that they could, you know, go to college and even that's changed now. They don't even that guarantee. CHANDRASEKARANActually, we have the most generous G.I. bill in our nation's history -- just on this last point here. I mean, for those who serve, our nation is doing something remarkable to help them get the education that they need to compete in the knowledge economy. The challenge is insuring that all veterans avail of the benefits they have and when they get into school, actually staying through to graduate. And then obviously the challenges they face when going to seek jobs. And that's where, you know, the work that some of these big companies are doing is so important. REHMAnd you're listening to "The Diane Rehm Show." But, Howard, even you must be really -- distraught is too lame a word -- when you hear and read about the V.A., for example, and how the V.A. itself -- part of the government supposedly established to help these men and women with the transition, has failed miserably. SCHULTZI think it's heartbreaking to hear the stories of veterans who have relied on the government and government services because of the solemn promise that we've made to take care of them when they come home. There's no excuse whatsoever. Having said that, the question is -- we can't continue to rely on government to do everything, especially when you see a story like the V.A. As a result of that, the private sector needs to do as much as possible. And our callers and everyone who's listening needs to recognize that we, too, can make a difference. SCHULTZI will say something about the V.A. Secretary McDonald is someone I've known for many years. I think he's the kind of person that will bring transformation and action. He's a West Point graduate. He gets it and given the support from the Congress, will make the changes necessary. CHANDRASEKARANWe need lines multiple lines of activity in this country. Washington has to come together. The Congress has to overcome partisan division to do what's right for veterans. The bureaucracy, the ossified bureaucracy of the V.A. needs to be reformed. Corporate America needs to continue to step up, do -- more companies need to do what Starbucks has been doing in making genuine pledges to hire and recruit veterans and then promote them. And then ordinary Americans need to do their part in reaching out to veterans in their communities. REHMThat also means the hiring process, which you have certainly done with Starbucks, Howard. Are you paying more than minimum wage? SCHULTZWe pay more than minimum wage at every Starbucks in the country. We're also hiring veterans in our offices to be brand managers and managers. It's all walks of life within Starbucks. And I am encouraged by the people I've talked to who are now stepping up and making a big commitment to hire veterans. But it's not only the big Fortune 500 companies. Many veterans are returning to small rural towns across America where there are small businesses. And we need small businesses across the country to recognize the value veterans can bring to their companies. REHMBut are they afraid? Is that what's holding these businesses, these corporations back? SCHULTZI think there's a misunderstanding and there's some trepidation and concern about some of the things they've read. But my own personal experience is they should not be afraid. These are wonderful people who can add significant value to our society, our communities and your respected company. REHMAnd you have experienced that all over this country. SCHULTZI have. And I have seen firsthand in our own company the -- over 1,000 veterans that we've hired, with no exception, has added value to Starbucks. And more than just value to Starbucks, they have made us a better organization. REHMSo are you issuing a call today for more veterans to apply? SCHULTZThank you for the perfect set up. Apply to every Starbucks in the country, but it's more than Starbucks. I'm encouraging and imploring every business owner and CEO to recognize their value to our society. Please hire a veteran. REHMHoward Schultz, he is chairman, president and CEO of Starbucks. Rajiv Chandrasekaran, he's senior correspondent and associate editor of the Washington Post. Their new book is titled, "For Love of Country." I want to offer my personal gratitude to the two of you. And to all those have served this country. My father who died on this day in 1956 came to this country in 1907, became a U.S. citizen and was drafted into the U.S. military toward the end of the First World War. So I thank him and I appreciate what he did for me, as well. Thanks to all of you for listening. I'm Diane Rehm.